Although books related to the never-ending discussion of the pros and cons of Darwinism are constantly rolling off the presses, there are only a few that have the potential to mark a major turning point in the debate. James Le Fanu’s new book Why Us? 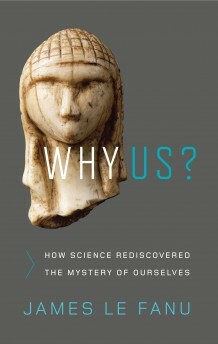 : How Science Rediscovered the Mystery of Ourselves may be another such book. Le Fanu is a medical doctor who has contributed articles and reviews to the British Medical Journal and the Journal of the Royal Society of Medicine. His previous book, The Rise and Fall of Modern Medicine, won the Los Angeles Times Book Prize in 2001. To put it mildly, Le Fanu is skeptical of the scientific explanatory power of neo-Darwinism. This, in and of itself, is hardly newsworthy. Many people have expressed skepticism about one aspect or another of Darwinism. What is potentially more interesting in this case is that Le Fanu does not raise his doubts from the perspective of Christianity or even Intelligent Design. On the existence of a Creator, Le Fanu seems to be agnostic (p. 122). His argument is more basic. He argues that Darwinism should be objectively judged like any other scientific theory and concludes that if it is judged objectively, we have to conclude that Darwinism is insufficient to account for all of the facts of nature. To demonstrate this, he focuses most of his attention on the discoveries of the New Genetics, in particular the Human Genome Project, as well as research into the workings of the human brain. He argues that purely physical and material processes alone do not account for all that we encounter and that there must be some kind of non-material biological phenomenon in existence as well. Le Fanu spends a considerable amount of time criticizing the weaknesses of Darwinism as science. He claims that Darwinism has survived as long as it has only because it is often formulated in such a way that it becomes immune to any and all criticism. Furthermore, he argues, in this one case, scientists prefer what many of them know to be a bad theory to no theory at all. This, he believes, results in Darwinism being a hindrance rather than a help to good science. He writes, “The greatest obstacle to scientific progress, after all, is not ignorance, but the illusion of knowledge” (p. 108). Darwinists, he argues, have locked themselves into a self-made intellectual prison that prevents them from seeing, much less exploring, the truly interesting questions about life. One does not have to be a prophet or the son of a prophet to predict the response that Le Fanu’s book will receive from the defenders of Darwinist orthodoxy. (Simply witness the response to Ben Stein’s film Expelled). We can expect shrill and dismissive book reviews, articles, and blog comments accusing Le Fanu of everything from incipient senility to mental illness to (worst of all) being a “creationist.” Ironically, most of these comments and “reviews” will be written by people who have not read Le Fanu’s book. In the scientific world, Le Fanu has committed the equivalent of blasphemy. He is the newest “Danish cartoonist” of Darwinism. I hope I am wrong about this. I hope that Le Fanu’s book will be read critically and thoughtfully by other scientists and not dismissed out of hand without having been read. Perhaps this is wishful thinking on my part. Perhaps not. We’ll see. Le Fanu believes that we are at the beginning of another major scientific paradigm shift, comparable to the Copernican Revolution, and that Darwinism will soon enough be placed on the shelf along with other discredited scientific theories. Perhaps this is wishful thinking on his part. Perhaps not. Again, we’ll see. Regardless of where you stand on this issue, Le Fanu’s book is worth reading.